There are 36 reviews of Parfum d'Habit. I've tried a couple different samples of this now. I feel like there could be iris in this. Something, at least, maybe the leather, is giving me an impression of iris (orris root). If I understand correctly, the oldest bottles are red with an argyle pattern (pictured above), the second version (of the bottles at least - I'm not sure about the fragrance in this case) is red with no argyle pattern, and the current version is clear glass. I see that they offer samples from their website, so I might try to get the current version to compare to the samples I have. On eBay, the second version bottles are available for about the cost of the current version. 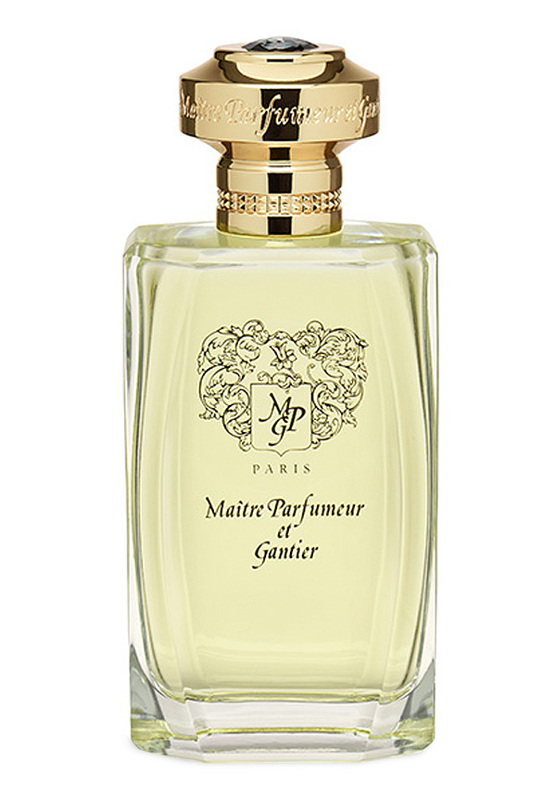 At the moment, I feel like this is my co-favorite fragrance from Maitre Parfumeur et Gantier along with Eau Des Iles. I need to give both of them multiple wearings to see how my impressions develop over time, and there are a bunch of other fragrances from this house worth sampling and/or further sampling. I'd like a more convincingly definitive notes list for this. The one from above is Patchouli, Vetiver, Sandalwood, and Leather. The one on their web site at the moment is Petitgrain, Bergamot, Blackcurrant buds; Patchouli, Geranium, Encens; and Leather, Sandalwood, Vanilla, and Ambergris. Why do I think I might be smelling orris root? And maybe lavender? I definitely like this, and a bottle is going on my wish list, although I'm not sure which version. My foot brushed the belly of my cat (let’s call him Jenkins because even cats deserve some Internet privacy, no? ), who likes to sprawl belly up, paws pumping the air, almost as though Robert Plant runs forever through his imagination, soundtrack to his semi-sleep as he climbs, in no particular hurry, his stairway to heaven . My big toe mound got stuck in Jenkins’ junk and, even though my boy Jenkins has been neutered all of his adult life, centuries of collective species’ memory sprung immediately into action and an ancient sound, low and dark, sprung forth from his half open jaws. It so surprised both me and Jenkins that we hardly noticed its effect on Ragnar, his svelte feline brother, who watched us from an adjacent couch. Ragnar’s ears were pinned back and his face was naughty, and filled with knowing, as though in an instant two thousand years’ of bawdy cat tales had flashed through his brain, and he didn’t, frankly, know what on earth he was supposed to do with so much instant ribaldry. Parfum d’Habit is ancient. It’s the scent of a time before time. Smelling it is to feel, somehow, that you’re smelling for the first time the essence of life itself, and you’ll wonder, immediately after, how you lived so long in such docile ignorance. 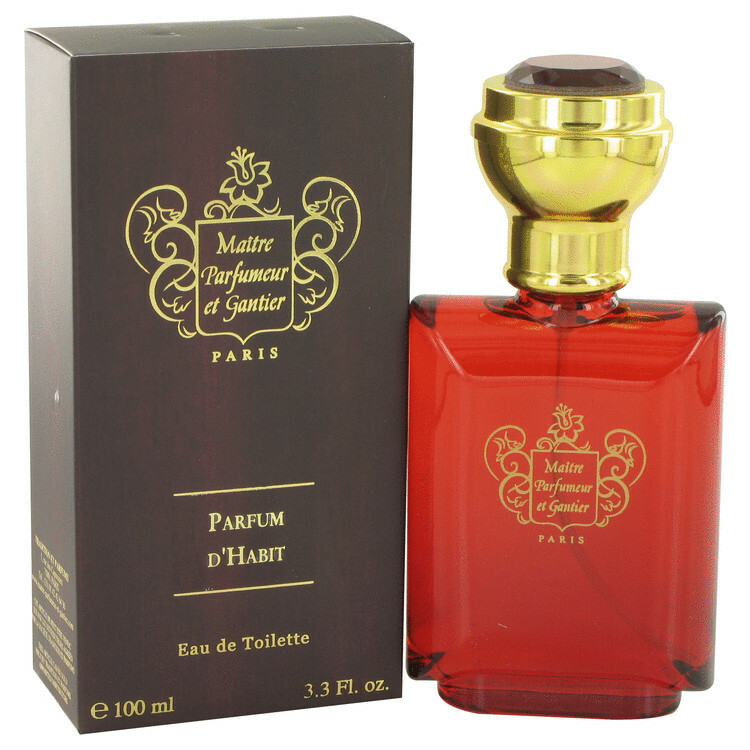 Seductive and wise, Parfum d’Habit is niche perfumery veering more towards philosophy than art. This is a scent of knowing, of mysteries revealed, and mysteries deepened. It seems to reach far inside you, into places that language cannot reach. Is it dated? Timeless things cannot age, and the only clock you need to worry about with this one, is making sure you get a bottle while you can. Man. Woman. Unisex. All things in between. Not only can anyone wear this, but everyone should. No question, this is an unbuttoned shirt, hairy-chested, testosterone bomb of a scent. And it's great! Stinks to high heaven when it goes on, with top notes reminding me of stale urine, but do give it a chance. Within five to ten minutes, I can swear I'm walking through a foggy west coast conifer forest, wearing a new leather jacket, with my enormous dog (he's real, at least,) by my side. The piney, resinous notes last through the drydown, while the leather intensifies and a gentle (if anything in this melange could possibly be gentle) sandalwood and musk sweetness rounds things off. How do they do it? Frankly I don't care, as long as I can have some. Great sillage, and you'll have to wash it off, because this stuff hangs around forever. This was a strange fragrance to get "comfortable with." Most reviewers are describing a cross between vetiver and patchouli, but it comes across to me somewhere near costus root but a synthetic analog like costalon, a strange aromachemical used that used to be popular in 80s fougere fragrances. It is overdosed in this one. I use this very very sparingly and layer it with some sandalwood essential oil to tame the fakeness of that predominant element. Once accomplished it has many redeeming blending qualities. This one opens up with a strong blackberry note mixed with greens followed by a dirty earthy patchouli accord. After a while a very strong incense/pine note seems to dominate the heart of the composition. When this starts to fade I can smell a subdued leather note. In the basenotes the woods start to make their presence known moore. This fragrance opens very loud and projects like crazy. It is a very outdoorsy and forestry earthy green scent. I do not like the incense/pine note as it is really overwhelming for the first forty or so minutes. The strange thing I found with this scent is it is really loud and overwhelming for the first forty minutes or so then it dramatically becomes more of a skin scent. The drydown is quite boring compared to the opening. Not a bad scent just not too my taste. I can't say that I was particularly impressed with this. It was mainly patchouli for me, softened slightly with leather. And I have smelled better leathers, and better masculine fragrances. Very "meh...". There are no member images of Parfum d'Habit yet. Why not be the first?